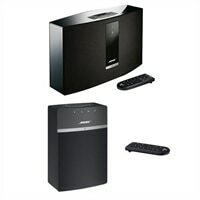 Bose - Sound Touch 30 III + Sound Touch 10 Speaker Wireless - BlackThis bundle includes two speakers. Bose SoundTouch 30 III. As a music enthusiast, you're streaming songs and favorite artists all the time. And the SoundTouch 30 wireless music system lets you hear them like never before. It connects directly to your home Wi-Fi network, so there's no complicated equipment to worry about. And it uses exclusive waveguide technology, engineered around a high-performance woofer to produce deep, rich sound that can fill even your large rooms. So start streaming your favorite music instantly, without a phone or tablet. Simply press one of six presets on the speaker or remote, and the music starts.